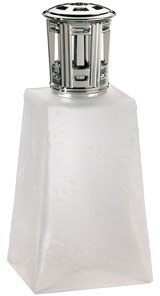 The Lampe Berger Ottoman Frosted lamp features antiqued figured glass in a tall obelisk form. This frosted Ottoman lamp comes with the heavy silver slotted top and is supplied in a nice gift box with a burner, funnel and instructions. Recommended by Imperial Galleries.